We have turned our living room into a giant play pen with baby gates on each door way. Because our cats are fat, lazy and some of them are old and stubborn the gates are raised off the floor 4-6 inches. 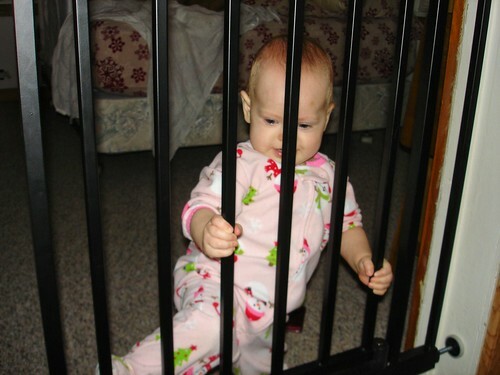 We knew that Lily might be able to wiggle under the gates but hoped we were wrong. We were not. Yesterday she was playing by the gate to our bedroom and threw a toy to the other side and next thing I knew she was in our bedroom. When I brought her back to the livingroom she kept trying to walk through the gate. Today I was able to catch video evidence of how ineffective the gate is. Under the gate from Christy Wiggins on Vimeo. Sorry the video is a little shaky I was laughing (silently) so hard at her. When I went in after her she took off in a high speed chase around our bed laughing at how fun the whole thing was. That is hilarious! What a funny little girl! I can’t believe you commented on my blog. For any readers that care Pop is my grandpa.